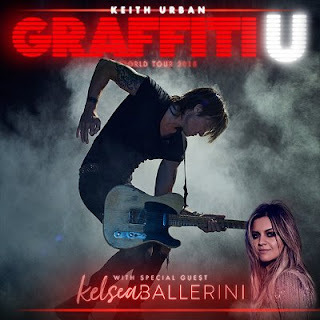 Keith Urban played a surprise show on Wednesday (January 17) night at the Exit/In club in Nashville, using it to announce that a new album is coming, titled Graffiti U, along with an extensive world tour that will play throughout the U.S. and Canada from June to November. Urban's last album, Ripcord, sold amazingly well. Opening at number 4 on the Billboard 200, it is currently in its 88th week on the chart with many of those being in the top forty. The accompanying tour sold over 620,000 tickets. Little more than the title has been announced on the Graffiti U album but dates for much of the tour are out. Kelsea Ballerini will open at most shows.